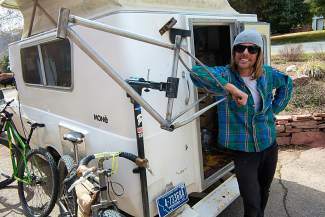 Taylor Zimmerman stands outside his mobile bike shop where he works at brazing his own bike frames. Zimmerman participated in the Tour Divide last summer, a bike race stretching from Mexico to Canada. EAGLE COUNTY — The race goes not to the swiftest, but to the rider who can stay on the bike the longest. By the time Vail’s Taylor Zimmerman reached the Tour Divide starting line, he’d already crossed most of the continent, had ridden from Vail to Minnesota three times, around Central America and through Mexico to the Tour Divide’s starting line in Antelope Wells, New Mexico, on the U.S. and Mexico border. He could have ridden to the starting line in Banff, but he works in Vail and is fond of warm weather. The Tour Divide is more than 2,700 miles from Banff to Antelope Springs, or the other way if you must, roughly along the Continental Divide. You’ll climb 200,000 feet in elevation, roughly seven Mount Everests. Zimmerman did it twice, finishing sixth and seventh. He watched the leaderboard, but said you’re doing it for yourself. “Unless you can take pleasure in the scenery and pushing yourself, you won’t finish. More than anything it’s a mental battle,” Zimmerman said. The winner covers about 250 miles a day. Matthew Lee is the Tour Divide’s Godfather. He has won five times and he races from Canada to Mexico. His latest winning time was 17 days, 15 hours and 10 minutes. 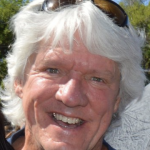 Lee says in his blog that each year brings a different set of challenges. “There was lots of opportunity for personal growth,” he said. Adventure cyclists do all kinds of cross-country routes, mostly from sea to shining sea. About 15 years ago, some folks came up with a backcountry route that roughly follows the Continental Divide. Before long it became a race. About 10-15 people fought it out for a few years. Now it’s up around 150 hearty souls. You leave Mexico and get to Canada — or Canada to Mexico — as fast as you can along the specific route. Single stage. Riders utilize only commercially available services — no support teams. Zimmerman’s first race was in 2012 and he wanted to be competitive. He trained hard and spent a bunch of money on his bike. For his mental preparation, he spent a month in a monastery with a monk in Malaysia. “It’s tough to mentally prepare for this sort of thing. If you let your mind do what it wants, it’ll kill you. Your mind wants to know how far to the next town, how fast you’re going,” Zimmerman said. The Tour Divide has a 50 percent attrition rate. “If you stop to eat or sleep and they pass you, you’re anxious about that. You have to relax and be at peace with yourself,” he said. The second year he said he didn’t manage his riding or his food, which led to this little detour. His frame developed a hairline crack, so he stopped at a frame builder in Salida to fix it. He was eight hours ahead of his pace from the previous year, but blew it hanging out with this guy and having a few beers. He doesn’t spend much money on bikes, touring on bicycles that cost $100 or less. He did one tour on a rock hopper he found in a snow bank in Vail’s Sandstone neighborhood, and then rode it from Vail to Minnesota. He rode a $50 bike from Costa Rica to the start line in Mexico. Then there was the touring bike he bought off Craig’s List that came with bags with legendary Vail endurance athlete Mike Kloser’s name embroidered in them. He paid $100 for that, too. He rode what passes for a normal bike in the 2012 Tour Divide. For 2013, he designed something less of a mountain bike and more of a road bike — comfortable handlebars, 3 inch balloon tires — a true singlespeed. Derailleurs get mud, muck and trash in them and get wrecked, he said. James Weekly, of Blacksheep Bikes in Fort Collins, builds curved tube titanium bikes. Zimmerman found it while he was riding a $50 Trek bike. They started talking about the Tour Divide and Weekly invited him to build a bike. He spent a month in Fort Collins, living in a VW van in their parking lot. He built some other bikes for them, and then spent a week building his own bike. “It was really benevolent on their part. He had no reason to help me with this,” Zimmerman said. He wanted to make everything himself, so he even sewed his own tent and built his own racks and luggage. He got on it and rode to the Mexican border for the race. He liked it and is now building them for others. When he finished in 2012, he didn’t want to be on a bicycle. This year when he finished, he turned around and rode 100 miles to Whitefish, Montana. He might ride another Tour Divide, but not this year. By the time you read this he’ll be riding electric bikes in a rally from London to Mongolia. Most people do it in tiny cars or motorbikes. Zimmerman and a partner are doing it on electric bikes for the same reason he rode across the U.S. from Mexico to Canada — he wants to.